There’s a certain zeitgeist that conspires to land government embarrassments on the same day’s newspaper pages and yesterday was one of those. We have a mostly well-intentioned government, but sometimes its pants are around its ankles when the lights go on. First, our president was caught scripting another ‘spontaneous event,’ this one a tele-conference with troops on active duty in Iraq. Makes me wonder who’s running the show in the White House and if there's a competition for dumb idea of the day. You’d think that, after the umpteenth time caught at such shenanigans, it would be a no-no, but some lessons are learned harder than others. This time it’s more an embarrassment than anything sinister, but there it is, our president supposedly having a spontaneous tele-chat with the troops in Iraq. 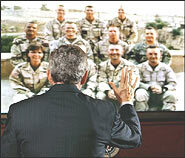 Rattling off one presidential euphemism after another, each is enthusiastically answered by a soldier. Turns out each smiling respondent was picked for the duty and told how to reply. Elsewhere on the page, it seems our wounded troops are not only suffering the pain and difficulty of matching shattered bodies to shattered lives, they’re being dunned for it by the Pentagon. Various stories have hit the media and certain powerful Senators are smokin’ about it, but the vast number of guys with garnisheed wages and credit-bureau blacklists are not getting any help from the military side. How’s that for thanking our troops? You get wounded, dragged off the battlefield in pieces and the Army charges you for the ‘lost equipment’ left behind. Never mind that you left an arm or a leg as well. Recovering in a hospital for months, these GIs get out to find chargebacks for any number of things from lost equipment to misapplied combat pay to the Army taking back their signing bonus money. If you get shot-up and don't fulfill the term of enlistment, no bonus. Even more disgusting, the Pentagon enlists debt collectors to hound soldiers and their families, reporting them to various credit agencies. Try to get a Visa Card after that. The Army blames an obsolete computer system they’ve been trying unsuccessfully for ten years to fix. I don’t know about you, but it amazes me that American business keeps up-to-the-minute computer technology humming right along and American government at the Pentagon and FBI and CIA takes ten years to still get it wrong. Completing the hat-trick of Washington-inspired embarrassment, a Brit Katrina hurricane donation of 400,000 packaged meals has been run down by our zealous USDA officials and impounded. So much for our distribution capability, the impoundment costs you and me $16,000 a month while a total of six government agencies stumble over one another to try to figure out what to do and who should do it. The USDA prevents all imports of British meat because of a supposed risk of mad-cow disease, even though we specifically asked for this food donation. A British version of military MREs, good enough and safe enough for Brit soldiers, they’re snagged in paperwork. A USDA spokesman says "There is no question that different consideration would have been given to the situation if people were going hungry.” Excuse me? All kinds of government agencies failed during Katrina. Nothing seemed to work right and the stranded were out of food and water, tired and dying. But our undaunted inspectors at the U.S. Department of Agriculture were up to the challenge. Determining somehow that people were not hungry, they chased this rogue shipment and nailed it down at fourteen separate locations across Mississippi. Neither rain, nor heat, nor gloom of night stays these couriers . . .
Take that, you thoughtless Brits.